Back before there were grandkids, cats and an ex, there were dogs, German Shepherds to be exact. On the cusp of the youngest kid going off to college, the last of the Shepherds went on to doggie heaven. I was well past the puppy stage of life, but not quite ready to be animal-less, so I called a friend who was a police chief. How can I get a retired K9? I called Randy, a well-regarded K9 trainer, who, as luck would have it, was looking for a home for a retiree. Fortunately, she thought I sounded like a nice person, so the vetting process began with her checking us out with our local vet. As we had put our vet’s kids through college with the medical bills of a number of horses and dogs, that was not a problem. He loved having our pets as clients. Then, the entire family, including the son at college, had to meet Randy and the retiring K9. Fero was pretty intimidating, prancing around us and checking us out. 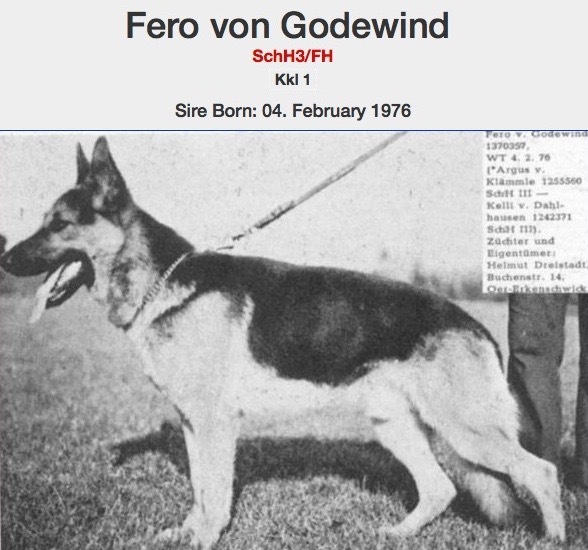 He was a Schutzhund III (the masters level of training: obedience, tracking, protection) German Shepherd imported from Germany. Fero made up his mind as soon as he nuzzled me. He jumped into my car and waited to go home. He was mine. Randy handed me Fero’s teddy bear and a K9 vocabulary list in German with two commands — attack and track — circled and not to be used. He was still the top tracking K9 in the area, so, even retired, he had to be available should law enforcement need him. She then loaded an enormous bag of imported German dog food into the trunk. He got that every morning and evening. Dinner also included raw beef or, as Fero got older, a cooked chicken breast and a teaspoon of cod liver oil for his joints. Some days he had a better dinner than I did. Fero was magnificent, massive and intelligent — he had a far better lineage than the kids and was certainly far better behaved. He was never on a lead and, being voice trained, would match me step for step unless told he didn’t have to heel. It didn’t matter what or who ran in front of him; he stayed focus on matching our steps. If he felt I needed protection, Fero could scare the Bejeezus out of both strangers and the soon-to-be ex, especially when he sometimes showed up in the middle of the night due to flight delays during our bi-coastal marriage cross county treks. When we first got Fero, we lived on a couple acres in the country — no fences — and this was very new for a K9. He had to learn how to be a normal dog after being kenneled all of his working life. My neighbor, a family therapist, used to take her pooch out on walks every morning and all the neighborhood dogs would join in. It was a motley group to say the least, but they all enjoyed the morning trek. Fero wasn’t too sure, but she invited him so he trotted along. She called me to say it was amazing to watch Fero — he observed the other dogs to see how he should behave. He caught on very quickly. By that evening, when another neighbor and I took our evening walk, usually just with our two dogs, Fero had the routine down cold. Almost too quickly, as it turned out. Fero started disappearing for hours at a time. Not good. I went out looking for him and, almost a mile away, he found me. He ran down a long driveway, barking excitedly for me to come and see what he had found. There was a new canine friend, an old black Labrador, and the two old retirees were evidently spending hours lounging next to a pond, watching the swans and ducks. Had they been old men, all that was needed were mugs of hot coffee, a shared newspaper and maybe a pipe or two to complete the Norman Rockwell painting. It sadden me to tell Fero that he had to stay home, but he understood and never wandered again except for the approved morning and evening walks. I occasionally wondered what life would have been like had our kids been so obedient. that is of course why I didn’t meet him. It was just before the east coast, but I had him in Pebble Beach…we used to walk on the beach every day after driving back from school — I had him for around 8 years. My sister-in-law has always said that if babies and dogs love you, you can’t be all bad. Clearly, Carla, you’re not at all bad. What a wonderful adventure. Did you ever get to see him work in protection or tracking? I didn’t except when he was protecting me. That was pretty darn intimidating! One time, my daughter (17 and should have known better) kept trying to wrestle with him, like she had with our other dogs. Fero kept whining; I kept telling her to back off, but she wasn’t as well behaved. He finally snapped and bit her above the eye; she still has the scar. Then, Fero felt so badly, he got his teddy bear and paced up and down our long hallway all night crying. When I mentioned it to Randy, she said. “ah, that was a warning. If he was serious, your daughter’s face would have been gone. He was the most vicious dog we had. Tell your daughter.” oh…. Most of the time, though, he was the most gentle, friendliest dog who loved people and other animals. I had him til he was about 15 or 16 years old.